Add another team to the long list of milestones that will be marked during the 2017-18 season. 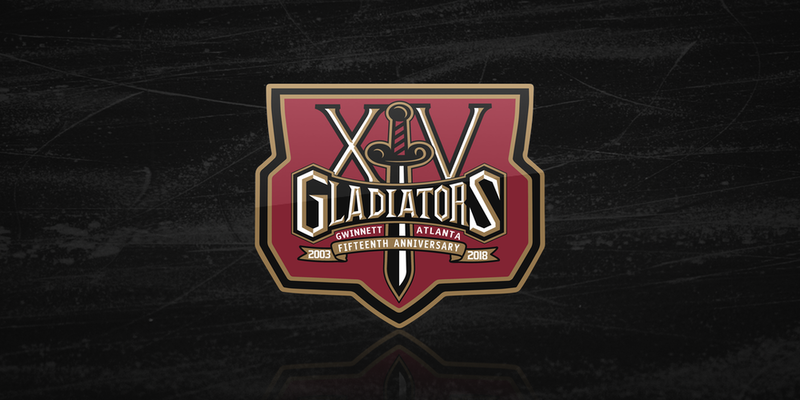 Yesterday, the ECHL's Atlanta Gladiators unveiled an assortment of new logos to celebrate their 15th anniversary. Top left is the primary mark, next to that is a secondary version. Bottom left is the crest and bottom right is the jersey patch variation that will be worn on the players' uniforms throughout the year. The primary logo and crest are rather heavy on the text, which is unfortunate. I prefer the secondary mark because of it. But the jersey patch will be a nice element. The franchise was founded in 1995 as the Mobile Mysticks (Alabama) and relocated to Duluth, Georgia since 2003 to became the Gwinnett Gladiators. In 2015, a few years after the Atlanta Thrashers moved to Winnipeg, the Glads adopted the ATL into their name.